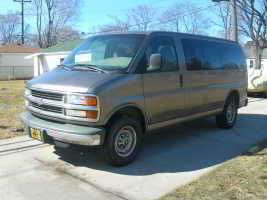 I finally got around to putting up some updates and adds for the Bob’s Garage site.Included is an updated cruise calendar and some updated and new pages for my 3500 Express van. I will also be tweaking some pages, Your Michigan Car and Find Me, to use some jQuery features that I like. Check them out. And yes I know some of the menus in the Garage section are not right just yet! Working on it! On the last installment I mentioned that a customer gave me a set of ladder rack rails. They were intact but a bit weather worn. So I set about refurbishing them. Yesterdays task was to cut all the rusted attaching bolts off. Done. 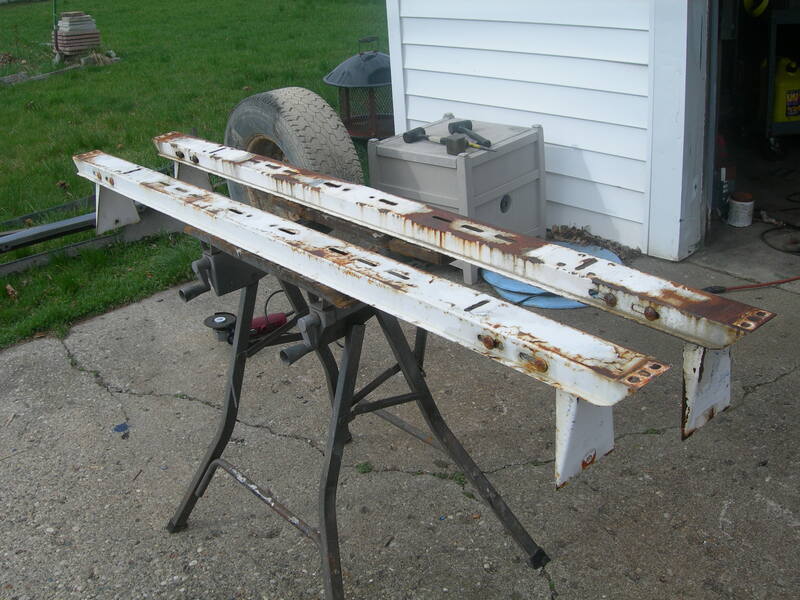 Today I decided to strip and repaint the rails and mounts.So it was a long day of grinding and sanding. Ultimately I finished the 4 uprights, the 2 main cross members and stripped and prepped 2 of the 4 legs. All the parts are getting a couple of coats of primer followed by a couple of coats of gray engine enamel. I will probably shoot some undercoat on the under side of the rails and the legs. Kind of overkill but that’s the way I am doing it. So I should make great headway tomorrow. It looks to be another great day! UPDATE The update on the wicked rattle under the van have been pinpointed to some frame rivets that have come loose and need to be replaced. So the search is on for some replacement hardware. Still no solution as of now. But still looking into it. Hopefully they will be on Wun Tun Zoop here soon! Stay Tuned! In my quest to make the new van more useable I had put out the word that I was in the market for some used roof rack rails / bars. Well, one of my customers volunteered that he had an old set he had taken off his work van. I asked what he wanted for them and he responded that I could have them to get them out of his storage area. And I said “Excellent!”. And he said he would drop them off at the store on his next trip by. And yesterday he made good on his promise and dropped them off at the store. So now the project at hand is to disassemble them and get some new hardware installed. And with a little paint they will work well for my needs. I will mount them as soon as they are reassembled. Another project that has arisen is that I noticed a wicked clattering from under the van while driving on our enchanting Michigan roads recently. After i parked I decided to crawl under the van and take a quick gander. And with the first glance the culprit was obvious. All the exhaust heat shields, and they are extensive on this van, were hanging off. All three were in some way missing hardware that bolts them to the chassis. And simply using my hand I could generate the clatter I heard. So the plan of the day is to crawl under today and see if I can figure out what is missing and refasten them in place. The two internal-use batteries are now in cases. The two 31A series batteries are ready to be wire for use. And I wll be wiring up the internal-use power ports, plug-in and usb, in a bit. Another project for another day. I got the fuel feed line connector built and the lines are siamesed in. And all with no leaks! Excellent! So back on with the bed and bolted it down. Complete with the hockey puck spacers at the cab end. And a quick hot test with the engine running and we are free of leaks. Nice! I went ahead and put the tailgate back on and mounted the liner cover onto it. I may put the liner in tomorrow. And if I get adventurous I will make a run to the gas station and put some fuel in this beastie. It is way low on fuel. And I can give the fuel gauge sender a functional check at the same time. It is a bit loud but for now it will do. I have to fabricate an intermediate mount for the exhaust to fix the factory piece that went south and caused the whole thing to twist in the first place. A muffler clamp, some flat stock and 2 bolts will get the job done. After dark I went out and did a live check of the lights and all is good. Everything is working as advertised. Turn signals, headlights, running and license plate lights. Cool beans! The only missing item is the third eye / cargo light at the top of the cab. no biggie. I may tackle that tomorrow.I am hoping it is a simple lamp issue. But we shall see. For now it is all back together and ready for some new front shocks that it desperately needs. And then I might even get it tagged and insured to be a terror on the streets! Whatever! I will be glad to have it up and running and ready to do some work for all the time spent. And for now I am headed for dinner and a well deserved hop pop. Or two. See Ya! I ordered a new filler neck and a set of bed bolts online the other day and they are now here. Hopefully I can get the bed back on soonish. The bed bolts are simply 6 new torx head bolts and their matching j-nuts. Initially I did manage to get 3 off intact and the j-nuts were questionable. I made the decision just go ahead and replace them. A no brainer here. If I have to remove this bed again I don’t need any more issues. Simple enough. The filler neck is more of a maintenance and convenience item due to discovering some major cracks on the outer sleeve which is the vent mechanism. And that was discovered once the bed was removed. And I believe that was the first time the bed was ever off. And you could not have seen them as it was installed. It was actually an easy swap out. One band clamp at the base and a couple of twists and it was swapped out. DONE! After a bit of cleanup and reassembly I was able to put on the front bumper complete with fog light brackets and valence. All I need is to get some fogs and put them on the mount brackets. The factory Fords are nice but pricy. I will opt for some aftermarkets. I must say that Ford outdid themselves with these fog light brackets! These buggers are massive. Ii am sure it was intentional but none the less they are way sturdy. The lower trim valence is a bit rough but for now it is viable. I may replace it later. After a bit of a shipping delay, the new headlight housings and turn signal units are in, and I do say the front end looks way better. I have about gotten all the other prep work done for putting the bed back on. The rails are clean and I am also putting the tire carrier back together, after a cleanup , and will remount it. Complete with a spare tire. A couple of rivets will get it all reassembled. And it will put some weight in the rear too. All the bad bed retainer clips have been cut off and extracted. I am currently trying to find a new set. Ford wants $12 a piece [clip and bolt] and I need 6. A bit pushy. It appears Dorman makes a packaged set of 6 so I will price that out when I go in to work today. If the price is not equitable I found a used set on Ebay for $26. We shall see. There are a couple of pending projects. One is to repair the badly mangled rear harness with the new tail section so I have the factory connectors back in the loop. It should be a simple 6 wire splice job. [ No crimp ons for me!]. The other is replacing the questionable fuel filler neck assembly. Not a biggie just a “while i got the bed off” thing. So in other words I am almost there. But not quite. Stay tuned!